The wall at Hillside Terrace, which has been the source of some consternation at previous community council meetings. In Kevin Crawford, Selkirk has found itself a different type of community councillor – one who is keen to fix problems rather than talk about them. And it’s fair to say that the local businessman could prove to be very much a hands-on member after vowing to fix a wall which the community council has been talking about being a danger to schoolkids for months – and pay for it himself. The wall, in the town’s Hillside Terrace, made the headlines last month after a new plea by a concerned member of the public to stop arguing about who owns the wall and just fix it before a child is killed. And at Monday night’s meeting, the issue came up again when chairman Alistair Patullo asked if the council was any further forward with finding out who owned the field behind the wall and whether that owner, or Scottish Borders Council, or trunk road organisation Amey was responsible for repairing it. Selkirkshire Councillor Gordon Edgar said: “Scottish Borders Council won’t fix the wall as it is not their responsibility and it would set a precedent. Mr Crawford listened to the verbal rattlings about ownership and precedence and said he was just going to fix it, and foot the bill himself. He said: “I have the ability, the contacts and the materials. Why should we hang around and wait for an accident to happen? 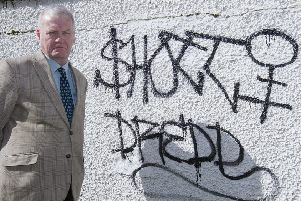 “This is one of the reasons I stood for the community council. I’m sick of hearing about people talking about things like this and nothing getting done. “The issue is with ownership, and neither the owner of the field behind, Scottish Borders Council or Amey is going to admit to being responsible, so it will never get fixed. His plans – which included employing a local stonemason – met with varying responses from his fellow members. Talking to the Wee Paper this week, Mr Crawford said he had scaffolding and all the equipment required to start the job on Wednesday of next week, and he’s not about to stop there. He said: “I’m also planning to clear the ivy off the wall in Yarrow Terrace, which has been another issue which keeps coming up.